May 2016: Visitors flock to Carolina Beach each year to enjoy summer vacations and the great outdoors. The island offers a nationally recognized seaside boardwalk, a state park on the coast, world-class fishing, miles of beautiful beach and more. 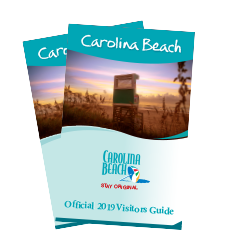 Make plans now to take part in some of the top family summertime activities at Carolina Beach during your next visit. Recently named one of the 20 Awesome & Affordable All-American Boardwalks for Summer by Budget Travel, our boardwalk is full of seaside family fun with amusement rides, shops, restaurants and nightlife, not to mention the iconic Britt’s Donuts, established in 1939 and serving famous glazed donuts ever since. 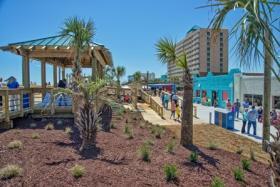 The newly renovated boardwalk is also home to a weekly fireworks and concert series during the summer months. If you’re in search of a variety of fish species, the Carolina Beach Fishing Pier is the place to be. The pier offers a full service tackle and bait shop along with a restaurant. There is a small fee to fish, but visitors can use the fishing rods from the tackle shop. The family-owned and operated pier has multiple tournaments, including king mackerel and “anything goes” catches – participants and spectators are welcome. Located two blocks from the ocean, the lake has been noted by the Guinness Book of World Records as the freshwater lake closest to an ocean. It features 11 acres of walkways, picnic areas, public restrooms and playgrounds. 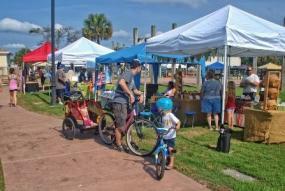 During the summer, enjoy the weekly Saturday farmers market and free outdoor movies every Sunday. A unique way to check out the boardwalk is on a Surrey bike. Rent two-person, four-person and eight-person bikes from Wheel Fun Rentals on the boardwalk or at Lake Park. Another option is to rent single rider bikes and take a self-guided bike tour to see the historic sites of Carolina Beach, Kure Beach and Fort Fisher. There’s no better way to learn to surf than with a pro. The surf school is owned by world-renowned professional surfer, Tony Silvagni, who recently placed fifth overall in the 2015 World Longboard Championships. Tony and his instructors will teach you how to surf or standup paddleboard in no time. The 761 acres of natural beauty offers plenty of outdoor family activities including hiking, camping, boating, picnicking and fishing. One of the most popular hikes is the Flytrap Trail, which is one of the only places in the world you can find carnivorous Venus flytraps growing naturally.